Basecamp is where you set up supplies and camp before beginning an ascent. It’s also UNDONE’s latest customizable watch. UNDONE has a history of making watches with online customizer websites, so that you can choose how you’d like your watch to look. This time, UNDONE’s back with BASECAMP, a vintage styled dive watch. 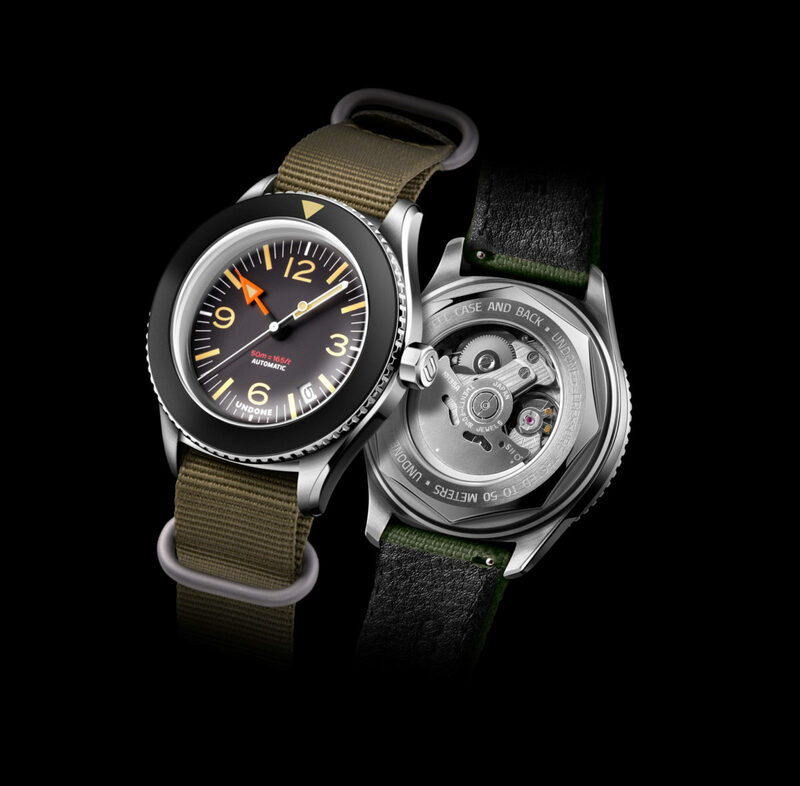 BASECAMP is a vintage-inspired dive-lookin’ watch. That means that it’s got lugs that extend from the center of the sides of the case, a big screw-down crown and no crown guards, with a coin edge style bezel that looks like it belongs in the 50s. The tops of the lugs are chamfered, and the crystal is a big dome Lexan polycarbonate. And that would be pretty cool, although BASECAMP has some of the same traits of the divers it imitates. Using an acrylic crystal leads to lower water resistance depth than the equivalent sapphire. The bezel is a friction-turn bezel instead of one that clicks, and can be turned bi-directionally. If that sounds strange, well, that’s what dive watches did until the late 1980s. BASECAMP is water resistant to 50m, which honestly, is good enough for swimming, hand-washing, and other normal non-dive activities. The dial is an interesting set of choices: there’s a date window at 4:30, and an aviation-inspired set of 12-3-6-9 numerals, like you might find in a Bell&Ross. The hour hand is a big orange hand that was first used on the Rolex Explorer II 1655, and has found its way into use on the B&R, Steinharts, and other watches. It’s commonly a GMT 24 hour hand, so it’s a little unusual seeing it used as the hour hand here. The bezel insert is a black one with a single white triangle at 12 o’clock. UNDONE’s history is making customizable watches. How can Basecamp be customized? There are four colors of case available – silver; gold; rose gold; and matte black, with the gold and black options rendered in PVD. The bezel insert can be either the plain black with single triangle, or an insert with 60 minute marks, and numerals at 15, 30 and 45. The date wheel can be white, or matched to the black of the dial. There are also four strap colors to choose from. sometimes described as "The best bang since the Big One." That plain black bezel insert looks great, I think.